First, I flew to Portland, where I stayed with a friend who I hadn’t seen in a long time and her two rad pooches. Portland was a really car-dependent city, which I didn’t love, but they have the largest bookstore I’d ever been to in my life, which I did! Powell’s books is so massive, it’s like 4 Strands put together! I wound up spending an entire day there, meandering through the children’s books and the science fiction section, spending hours picking through some dense astrology texts in the cafe with an excellent cup of tea. I was grateful to get to start this journey off with some intense introvert time – basically 3 straight days where the only thing to do was whatever I wanted. 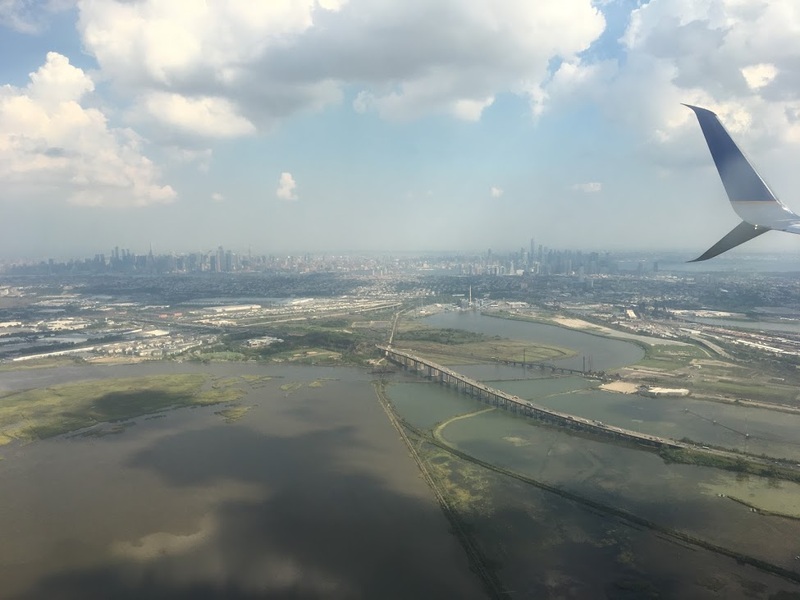 Coming off of ALF Summer NYC and knowing that I would be spending the next 6 straight weeks with people, I took advantage of the solo time to process, reorient, recalibrate myself; what does it mean to take care of me? If I can do whatever I want, what is it that I want? From Portland, I took a train intended for San Francisco. 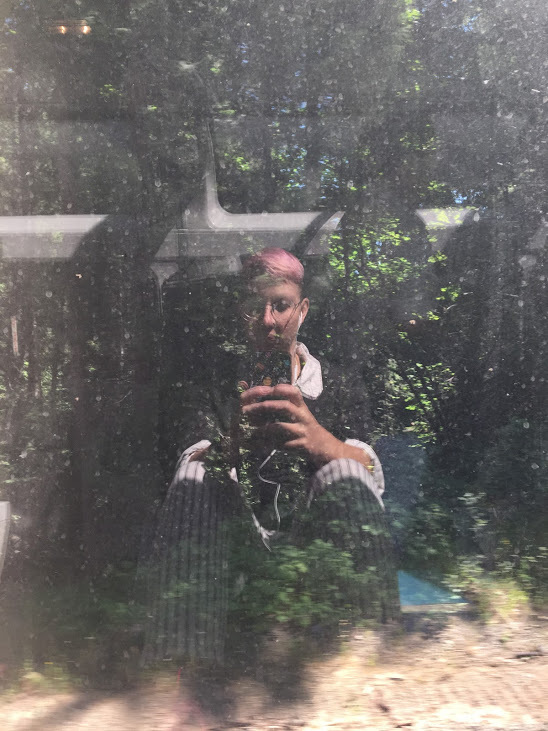 I love train travel; between the slow, steady motion, the scenery, and the other people on the train, I find it’s a really creative place for me. This trip, however, was not destined to be a smooth one. 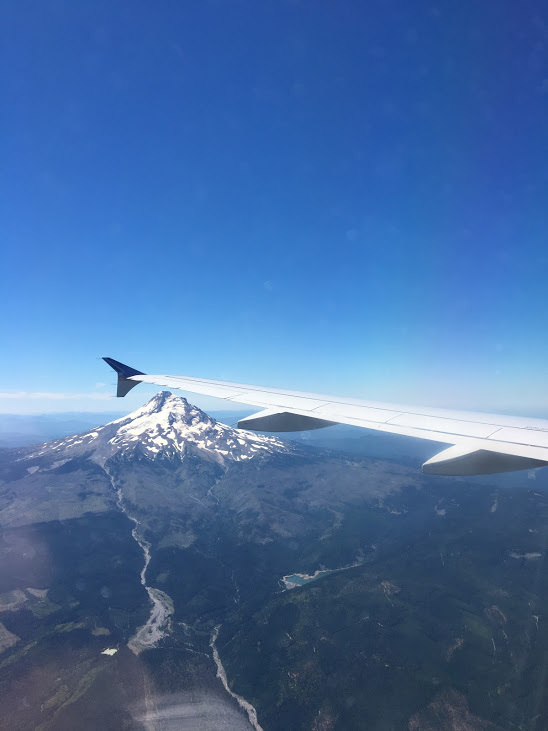 We left Portland at 2 in the afternoon and traveled steadily throughout the day, among the pines of the Cascades, along the river, through sunset and twilight and under the nearly-full red-faced moon. I fell asleep, looking forward to waking up the next morning at my destination, but a scant hour later I woke abruptly to the woman in the seat behind me yelling about FIRE! Not only was there a wildfire up ahead (the Carr fire, which would go on to burn for 38 days across 358 square miles, destroying 1600 structures and claiming three lives) but it had jumped the Sacramento river and our next stop – the northern California city of Redding – was literally on fire. The train hesitated there, on the border, overnight and I sat up and waited, stomach roiling, for confirmation of the rumor that we would be turning around and going back the way we came. Eventually it became clear confirmation wasn’t forthcoming that night, and I bought a plane ticket from Eugene, OR anyway, despite my gut uncertainty-discomfort. It would becoming a familiar feeling over the course of my travels; the discomfort decreased every time I chose to move in uncertainty. Finally, I fell asleep, and woke up the next morning to the news we were, in fact, going back to where we’d come from. 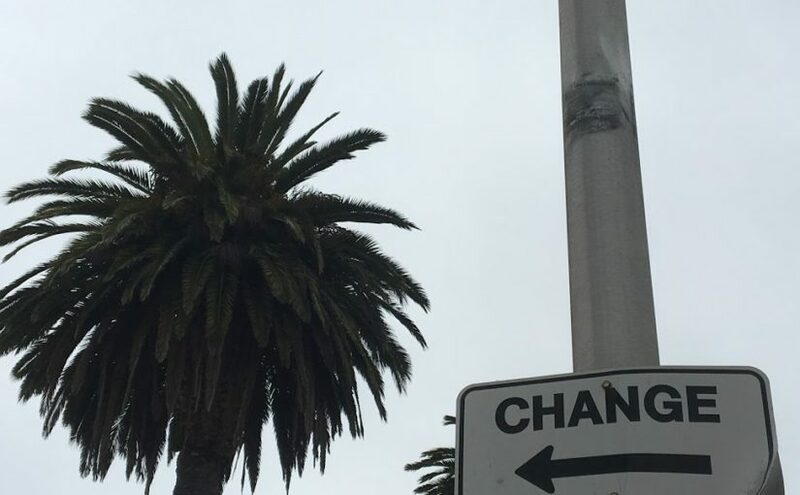 While I certainly wouldn’t be arriving in San Francisco when I had originally intended, there was nothing I could do about it. Mercury was in retrograde, after all, and at this point I’ve certainly had plenty of experience with travel trouble during Mercury retrograde. 5 hours later, 23 hours after I left Portland, I got off the train in Eugene. 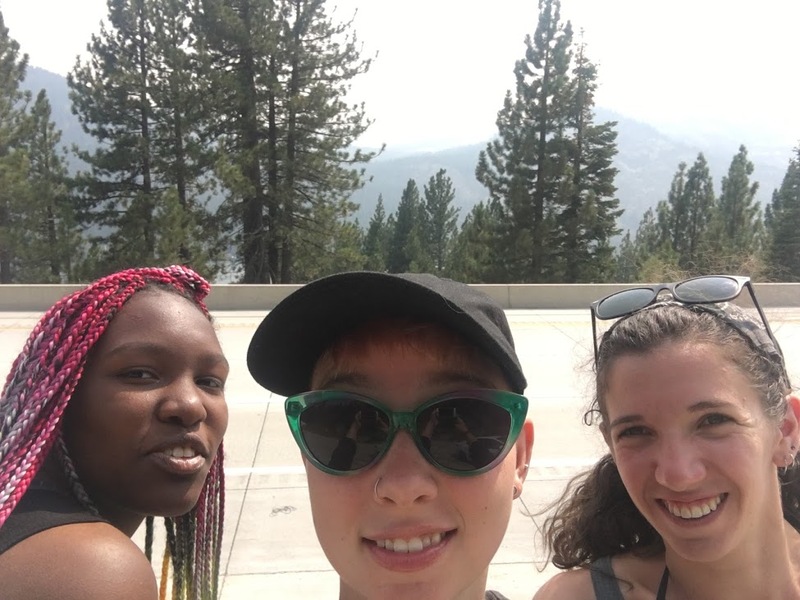 From there we decided to take a day jaunt to Lake Tahoe before ALF Summer Sacramento – we rented a car and drove across the (increasingly hazy) state to the mountains. Nahla and Abby had been to Tahoe before, but I never had. We arrived at the Sierra Nevada just as the sun was setting, so we did most of the climb in the dark, through the pines. The smell of smoke grew thicker in the air the further east we drove – not because of the fire that had caused my earlier turnaround but because Yosemite was also on fire. I had hoped to see the stars, but no luck. We spent the night in a motel and the next morning we went to a watersport rental place and rented jet skis! None of us had ever ridden them before and we had a blast – Nahla and I on one jet ski and Abby on the other. The visibility was low because of the smoke, and I’d like to go back sometime when I can see more – it was hard to get a sense of how giant the lake was (although we did spend a lot of time driving around it, so I do have some idea). After jet skiing, we swam in the water – clear and cool and so refreshing. I later learned that Tahoe was formed almost 2 million years ago, when the earth’s crust puckered and formed the mountains. It felt like that being there; I felt held by the water and the earth. After Tahoe we drove to Sacramento for ALF Summer! It was a blast – in part because the program was a perfect mix of humans I knew and humans I got to meet for the first time. Our first night in Sacramento we got to stay with Mia, her dad and her sweet puppers, Ala and Bama. After a day of water sports and highway driving, we were quite frazzled and so, so grateful for Mia’s hospitality as we collapsed into human puddles. After the night at Mia’s, Abby, Nahla, and I drove over to the AirBnb where we’d spend the rest of the week with a crew of rad people: Antonio (of Abrome, in Austin, TX), Mercer and Joe, who came for the first few days of the program, and then Lavonne and Binairbah, who flew all the way out from NYC just to attend bonus week! We had so much fun cooking, eating macaroon ice-cream sandwiches, watching Steven Universe, singing along to Hamilton, and playing Cards Against Humanity (which Mercer had never played before, and cracked me up by cracking herself up with her own jokes. Such a Leo). As an introvert, facilitating all day can be really draining, and facilitating with adults doubly so; I’m grateful that I got to stay in this particular houseful of people, both because they were supportive and joyful company, and because they were super understanding when I needed to retreat into my room and close the door to recharge. ALF Summer itself was an inspirational, productive, fun, creative, challenging whirlwind. I’m particularly grateful to Beth, Mia, and Emily, Spence, and all the Free to Learn kiddos for their enthusiasm, playful groundedness, and support facilitating the program. Listing to Nahla talk about deschooling was definitely a highlight for me, as was doing Acro with Mia, Emily, and Jordan, swimming in the creek with the tinies and making self-portraits with 8-year-old Evie 🙂 Also shoutout to the puppers Checkers and Oreo, who brought a lot of levity to some heavy conversations. 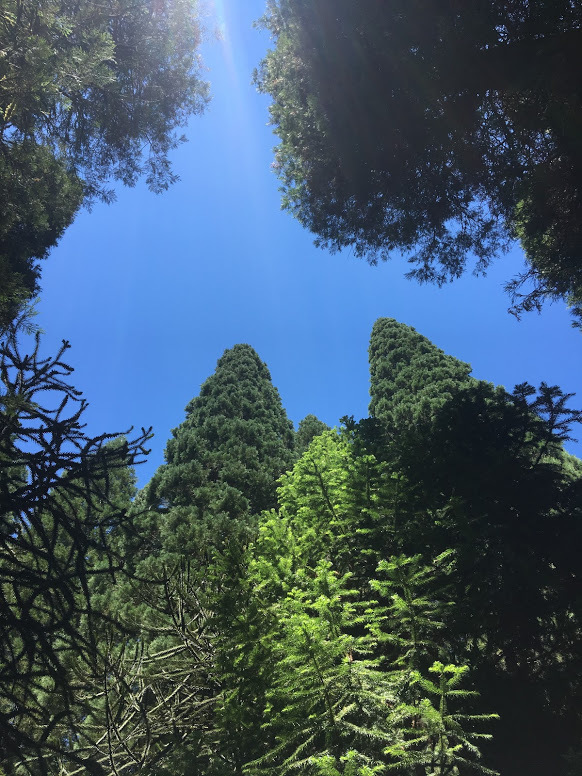 An ALF Summer is always a time of tremendous growth and change for me, and this one was no exception – for brevity’s sake, I’ll leave it there for now. There was a new moon&solar eclipse the after the program in Sacramento ended, and I desperately needed some alone time. 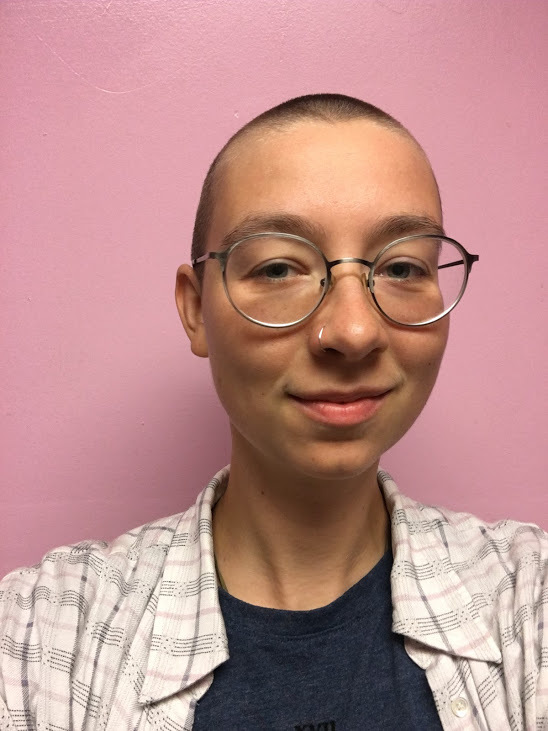 So I took the train by myself to San Francisco – trains, as I mentioned, being a restorative, creative space for me – and then cut off all my hair. It was an emotional day, but ultimately a relief. Haircuts and train time: the medicine I need. 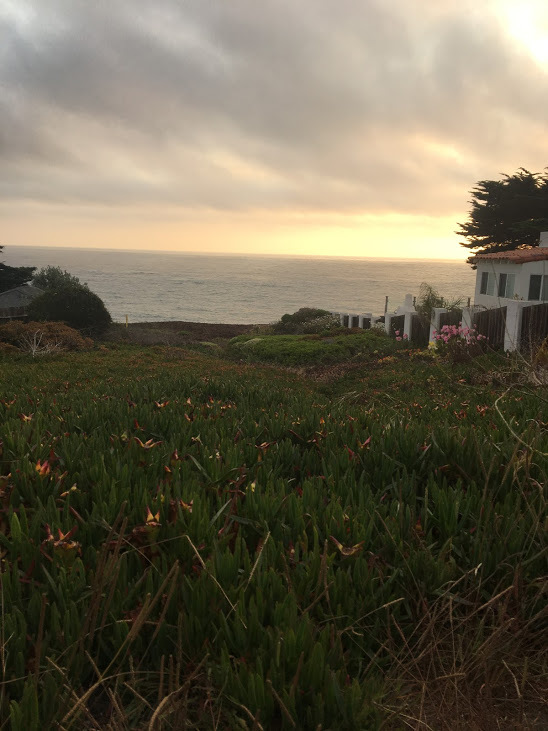 From San Francisco I took another train out to meet a friend from NYC at a hostel at a place called Point Montara, which was on a cliff overlooking the Pacific Ocean! As with Lake Tahoe, Abby and Nahla had been there the year previously, but Kirsten and I didn’t know what to expect – we got there and were totally floored by the beauty of the place. 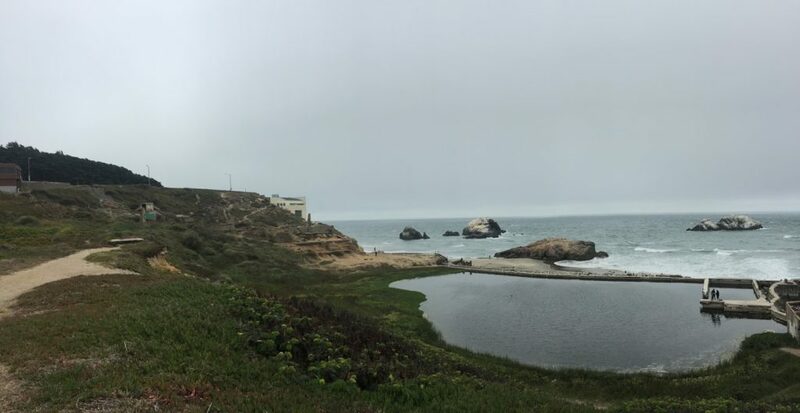 The cliffs, vivid with succulents and sandy, ocher soil, the grey-blue of the pacific, the susurration of waves, the gulls, the bands of clouds. We ate Mexican food and watched the sunset together eventually Abby and Nahla joined us (having spend the day scrambling to help everyone else get home as Mercury Retrograde messed with their travel plans…). The next morning we woke up and climbed over the cliffs where the ocean broke on the shore, and I stood with my feet in the freezing water, and we marveled at it all. 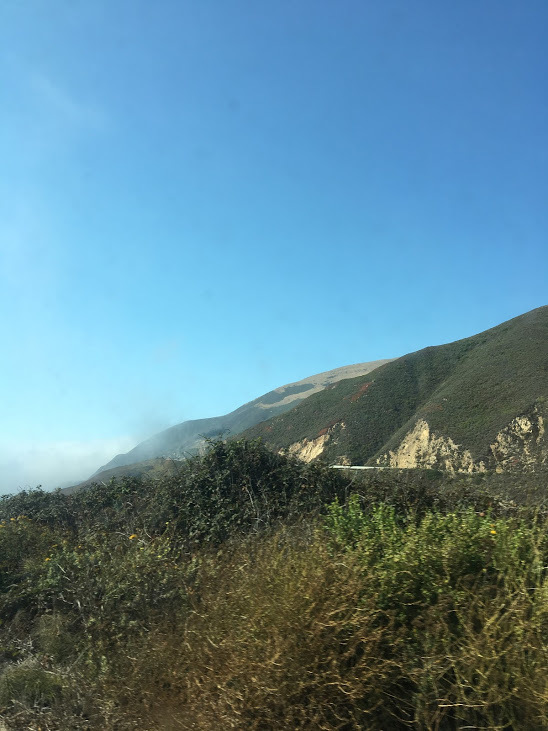 We spent the rest of that day driving down the Pacific Coast Highway to LA – a muuuuuuuuch longer drive than any of us were anticipating. Since it runs literally along the coast (on a cliff, next to the roaring ocean and a bank of clouds…) it’s relatively slow going, and very windy. Luckily, Abby is a really great driver. 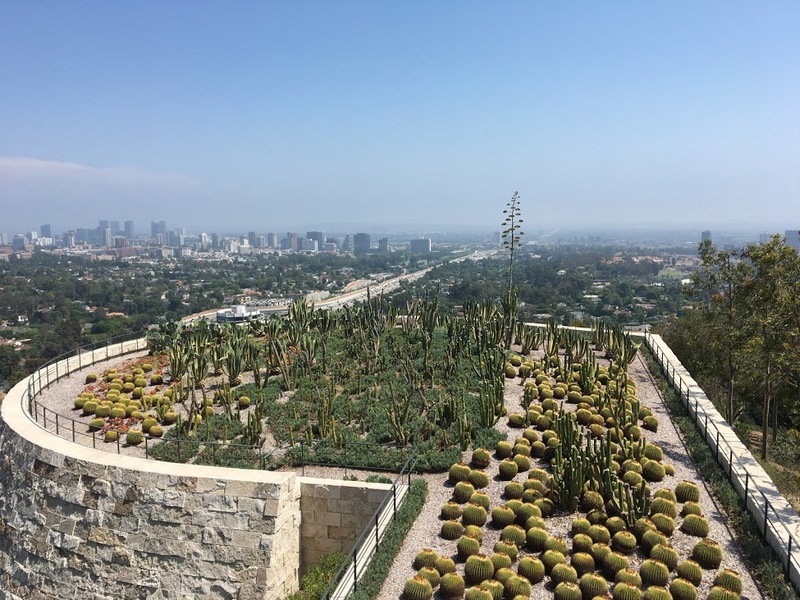 This view from the Getty Museum was my absolute favorite… and the art was great too! 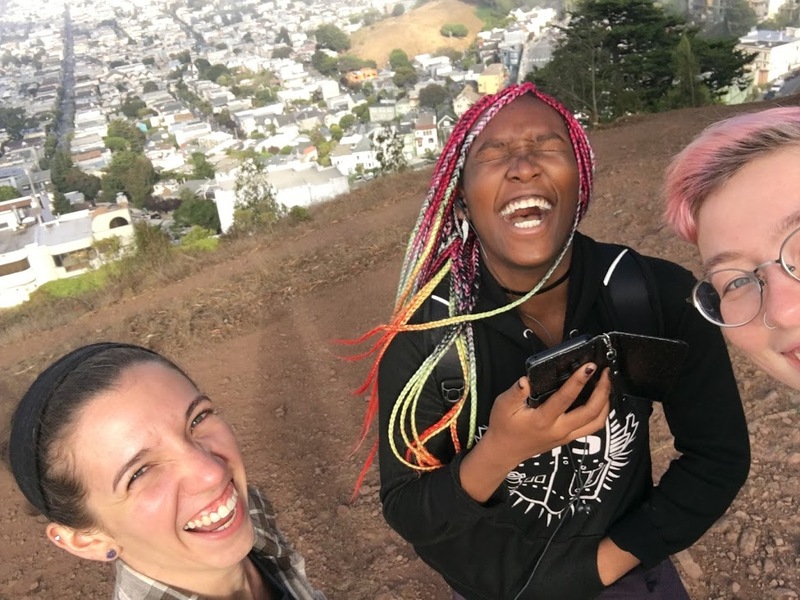 After a week, Abby and I dropped Nahla with her family and Kirsten at the airport and headed inland, where we rented another car and went on an unexpectedly surreal road trip. We drove up into the “sky island” of San Bernardino National Forest (which is classified as such because the flora and fauna that live at elevation are radically different from those in the surrounding lowlands) and hiked, tried to swim in a lake that had mostly evaporated, and then drove down the mountains and across a stunning desert as the sun was setting to go camping. We car camped in Sequoia National forest and woke up the next morning to swim in the Kern River, which is remarkable for the ferocity with which it flows at 5,000 feet. We were looking for a hot springs and never found them; the river was cool and clear and fast-moving but not too deep or strong – a joy to swim in. I didn’t take any pictures of the river, because I was too busy being present. I regret nothing. Going into camping, we were feeling very pleased with our route-planning; after our road trip, we were headed to Fresno, CA, where the crew at The Bungalow had invited us to stay (Manny and Miranda came to the training in Sacramento, and we’d met Jenny on several Monday evening ALF calls). 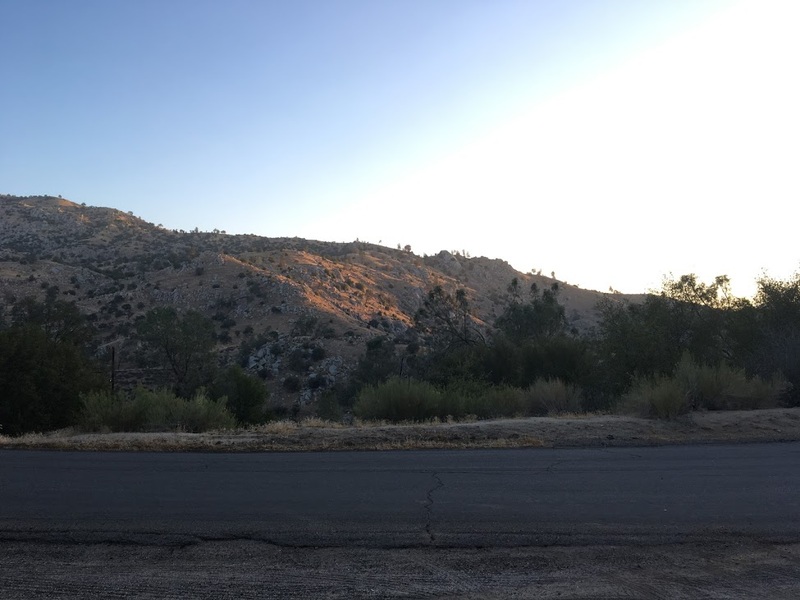 But the Mercury retrograde/fire season combo struck again, and we discovered quickly that all of the roads ahead were closed because parts of Sequoia were on fire as well – all the parts between us and our intended destination. We wound up having to double back almost 2 hours of driving (and the beautiful deserts of the night before were somehow less exciting the second time around…). We did eventually make it to Fresno, though, and (after stopping at an “underground garden” that was really weird and cool) were received by the generous company of Manny and Barbara, two of the Bungalow facilitators, and their family & dog Banjo. We spent two days with them and the whole Bungalow crew climbing trees, playing games, planting the garden, practicing headstands, drawing with kiddos and offering words of support in their first few days of school – they’ve got a really rad space and group of (creative, mess-making) humans to fill it, and I’m so excited to see how they grow! 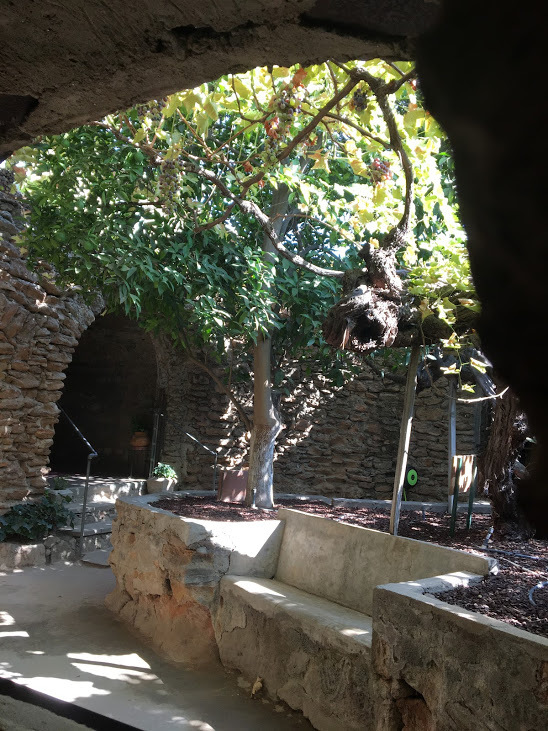 It was an actual underground garden… and that tree is nearly 100 years old! 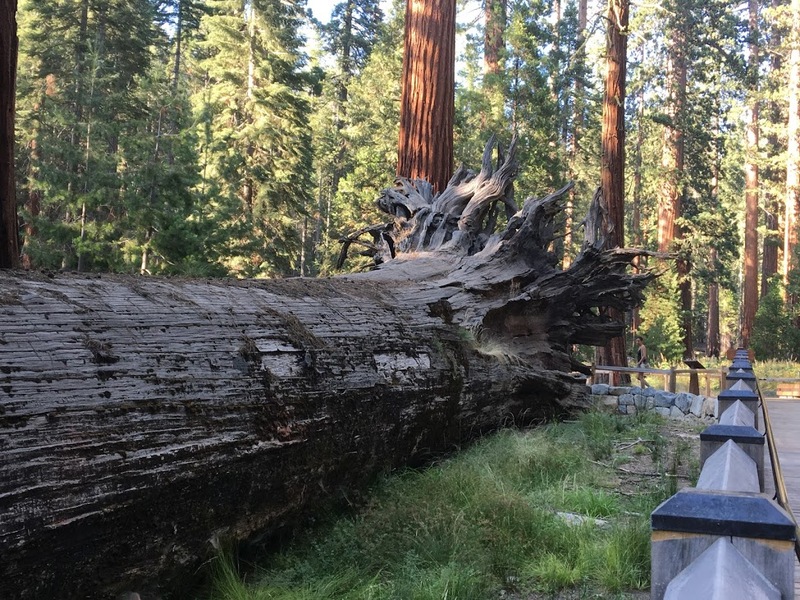 After Fresno we took a detour to Yosemite (still on fire, but Mariposa grove, where the giant sequoias are, had recently been reopened to the public), where we took the most expensive photos of our trip (entry to the park is $35/car… and good for 7 days. We only had an hour. Whoops!) and then drove out to Santa Cruz. 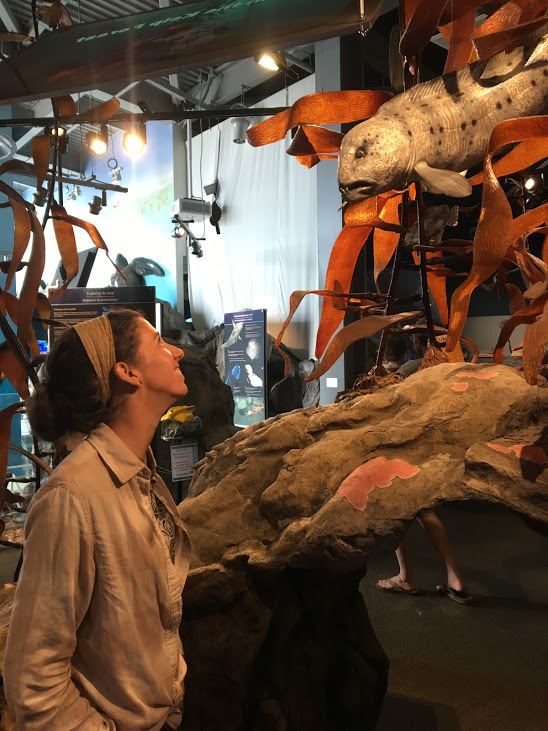 The next day was the first day of VIRGO SEASON, which I opened by pulling tarot cards at the beach and swimming in the freezing ocean; after, Abby and I explored the Monterey Bay National Marine Sanctuary center, ate vegan food, and headed off to San Francisco. It seems appropriate that our California adventure began and ended in San Francisco; closing that loop was deeply satisfying. We stayed with a friend, Nicole, who we’d met at the AERO conference in June – she’s a play master, and was so generous with her books and art supplies and musical instruments. Over the course of the week we built a blanket fort in the living room, talked art education and play, and saw the SF Neofuturists together. 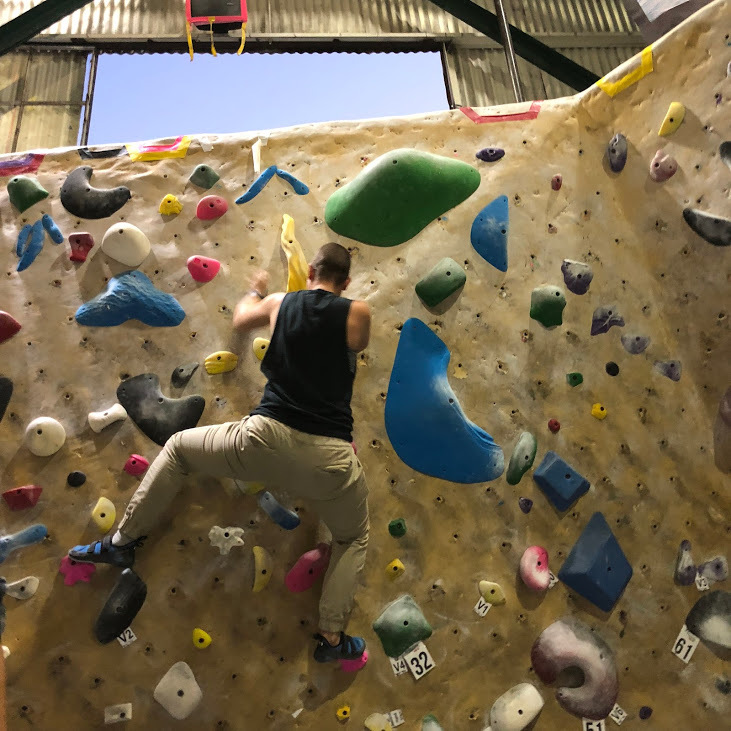 Besides hanging with Nicole, I went climbing with some friends who had just moved to Oakland from NYC; a comforting reminder that I have all kinds of community all over the country. I also took a solo day and went to a Magritte exhibit at the SFMOMA, which was SO COOL – I knew the famous apple-in-front-of-the-bowler-hat painting, but seeing it in context really shifted how I saw it. Magritte is a surrealist, but his surrealism is primarily concerned with perception – how do we know that we’re seeing what is when we’re limited by our perspective? How does the naming of things shift what we see? What if something is magnified? What if it is a paradox? The best moment came when I turned a corner and came into a room full of his Night Street/Day Sky paintings; I hadn’t realized that my favorite painting in the MOMA here is part of a series! 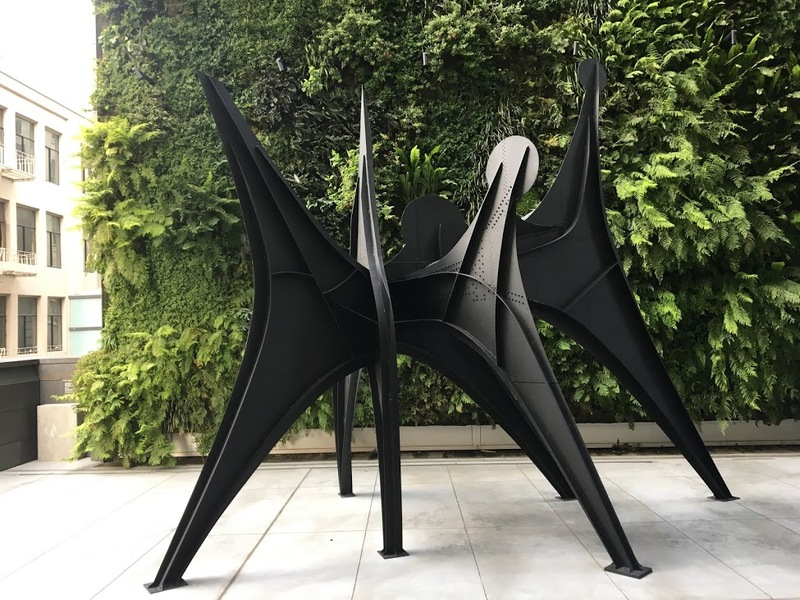 SFMOMA also had a bunch of Calder sculptures, as well as a large exhibit on Sol LeWitt, whose abstractions are concerned with the intersection of process, instruction, language, and construction. All in all, it was a great museum experience and I highly recommend it. After that we flew to Mexico City, via Guadalajara. 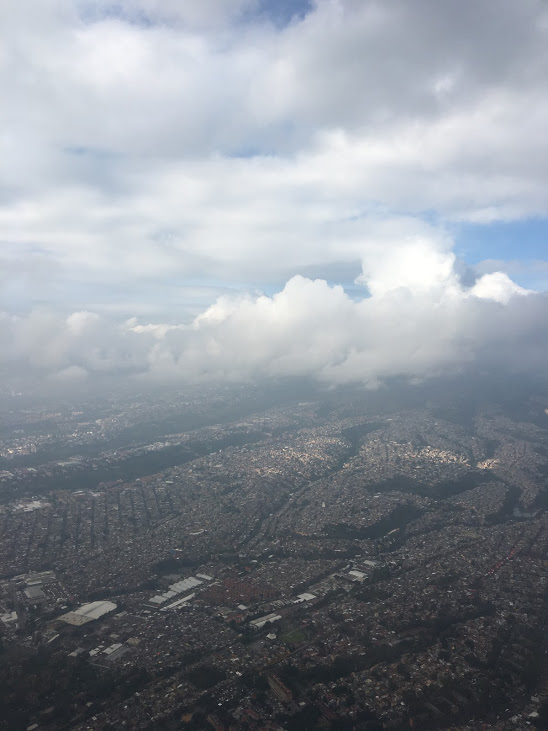 We only got to spend 6 hours in CDMX (which is the local abbreviation for Cuidad de Mexico) but it was incredible there – the cool, humid air a welcome change from the hot, dry California desert, and the lushness and vivid color of the city, a delight. We visited the Frieda Kahlo museum at Casa Azul, where I was particularly struck by the exhibit on her clothing. Frieda contracted polio as a young child and then, when she was 18, she was in a bus accident that left her in pain for the rest of her life – her famous dresses were, in part, a cover for the many braces, supports, and corsets that allowed her to move about independently despite the severity and extent of her injuries. 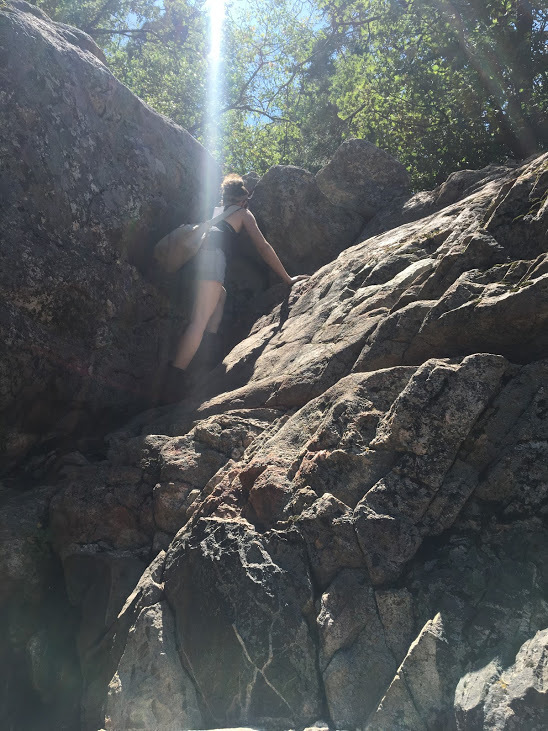 As someone who has been struggling with my own body, I felt a real connection with her. I’m grateful we spent the one day we had in her city there, and I’d love to go back someday soon and explore more. 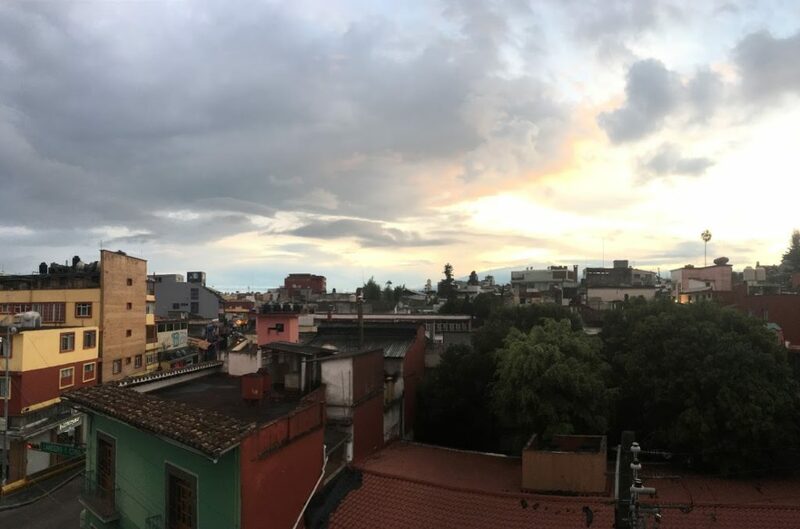 From Mexico City we took an (incredibly gorgeous, 5 hour long) bus to Xalapa, where we stayed with Rubén and Vivi! Xalapa is a city of about a million people – not orderly, like the grid here, but narrow and colorful and turning, full of surprises. 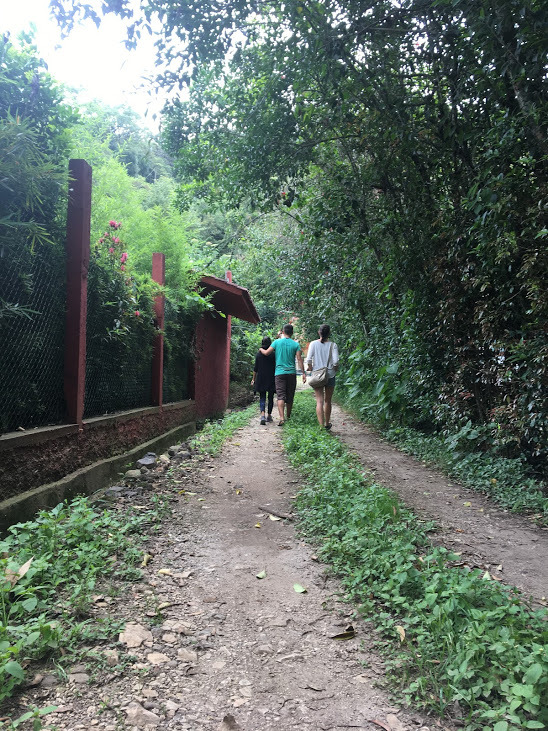 Our ten days there were beyond delightful – Rubén, Vivi, Omar, y Moni were incredibly hospitable, the food was delicious, the city was bustling and the surrounding area was green and cool and alive with plants and rivers. 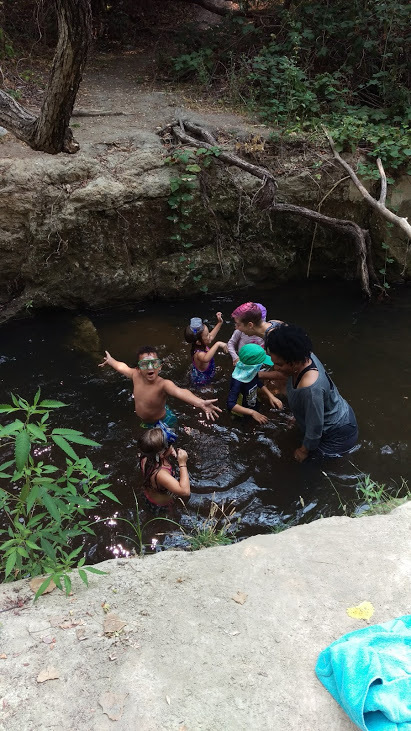 We spent a day with the crew at Educambiando, which was so so fun (We played capture the flag! I learned to embroider! I taught Ruben and Vivi a counterbalancing pose!) and also so good-challenging for my translation skills – I speak baby spanish, only in the present tense. 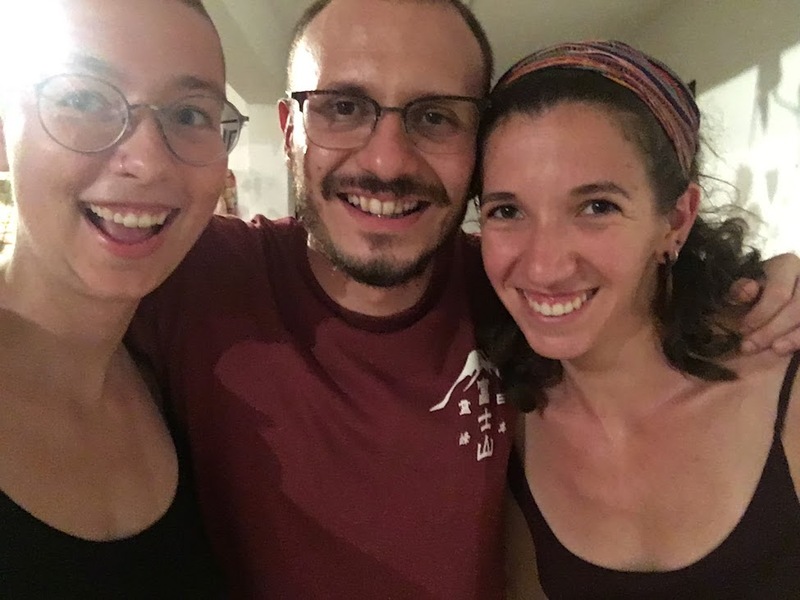 We drove out to Vivi’s house one day, which is like a beautiful dragon egg, and she made me tea from Yerba Buena from her windowsill garden and then we swam in a cold, fast, clear, shallow river while Ruben balanced stones. We went to a park and played on a slackline while Abby made friends with a beetle. We had a party and played a giant game of ninja and an absurd game of charades. My favorite, most unexpected adventure in Xalapa was group singing! Leon, who is friends with the whole ALC crew in Xalapa, runs a music and arts program there, where every Wednesday night he leads a singing group. He’s a brilliant facilitator – he had a group of a dozen people of vastly divergent experience and musical knowledge singing together right away. He’d teach us a simple, repetitive, 3-part foundation – a blues baseline, or a chord – and then, once we got the hang of that, he’d point to a person in the group and have them sing, call-and-response, with him over that foundation. Every person sang each “song” – it was incredibly satisfying and brilliantly scaffolded so that even people who might otherwise be afraid to sing in front of a group felt comfortable, since we were all singing together. Afterwards, he kept saying “it’s so healthy for your soul” and that’s how it felt – like my soul was being watered. After, I sang with just Leon – he played the guitar and we worked our way through the jazz standards we both knew – and it was like I was discovering my voice for the first time. It wasn’t all playing and exploring – there was work to do. Ruben, Vivi, Omar, Abby and Moni spent a lot of time working on/prepping for the Agile conference happening in San Luis in November (and seriously, props to them for the incredible amount of work they got done in a week. Abby is a programmer now!) 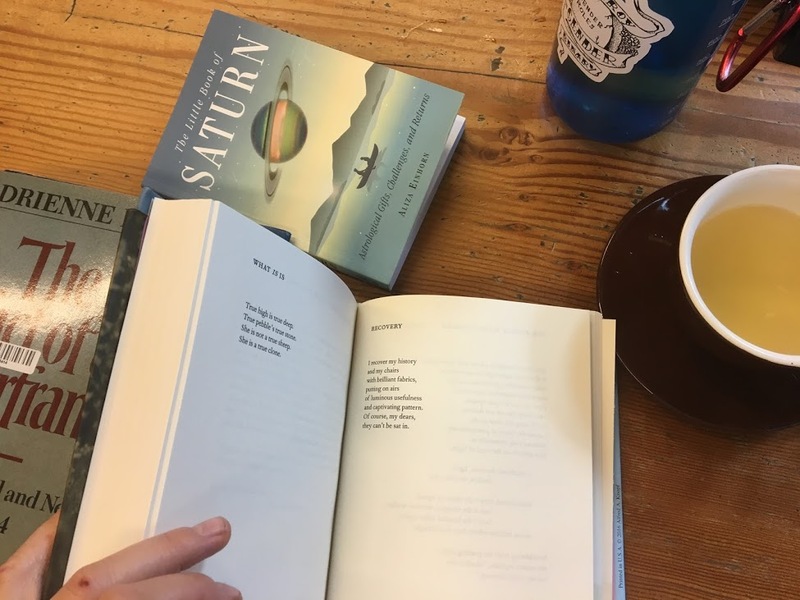 while I painted, and read, and rested, and walked, and took myself out to breakfast, and admired the light, replenishing and renewing myself to be present for the school year. 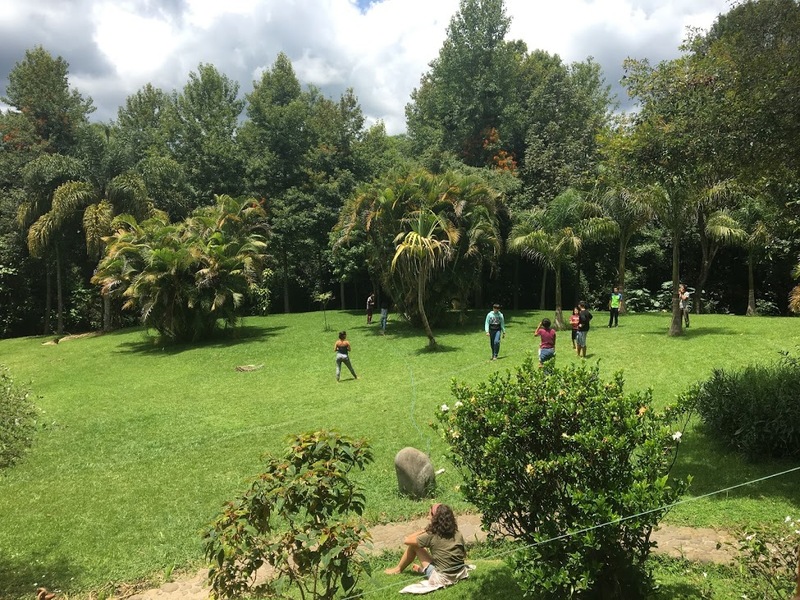 Xalapa was both an incredibly restful and productive place, and I’m so grateful to everyone I was with there – Ruben and Vivi in particular – for a beautiful final destination for my journey. That’s where I was! Phew! Thanks for sticking with me through this very long post! On a final note, I want to thank everyone who read my last blog post. 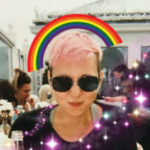 It was a very cathartic piece to write, and and I’m grateful for the feedback I got, and for the sense of relief I feel at being out as a non-binary person on this blog. This piece felt very different to write, but they are two sides of the same coin; as I traveled, as I practiced sitting in uncertainty and being present and not knowing, sometimes, where I would sleep tomorrow or how the next leg of the journey would feel, I was also traversing my subterranean landscape. This summer was a long journey, in a season of upheaval, astrologically speaking – lots of planets in retrograde and three big eclipses. I changed a lot, and realized a lot about my self and my work and the ways I am growing – I filled 4 notebooks with drawings and watercolors and writing, writing, writing. I’m grateful that I left, and awed at the size of the world, and grateful to come home, to think about what home means for me. As always, this has been an incomplete report. Thanks for witnessing. Next Next post: What Are You Up To?